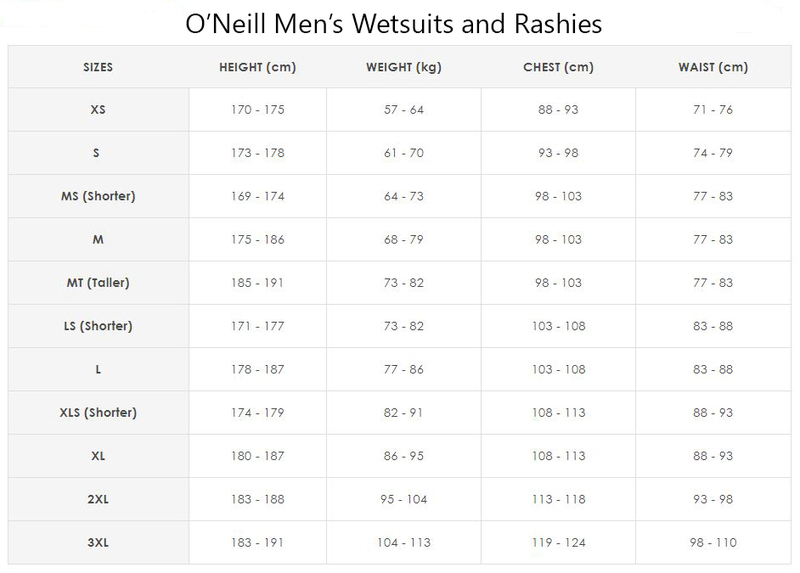 O'neill Men's Superfreak 3/2mm is a wetsuit that has stood the test of time as a market leading performance for over a decade due to superior R&D and the desire to progress! Just because O'Neill invented the wet suit doesn't mean they can rest on their laurels. Depending on how you tolerate the cold, this suit will keep you toasty surfing around the 17-22 Celsius mark. This year's Super Freak takes ~66 years of experience and puts it to work on the plethora of functions and features present in today's wetsuit. The combination of 3/2m thickness, a GBS & Taped seam and O'neill's new Super Grill lining combine to deliver a top-shelf wet suit that's easy to get on thanks to the back-zip entry. This no fluff wetsuit is the best take on a classic surfing wetty. UltraFlex DS Neoprene - Stretchier, lighter and warmer than ever before. Super Grill Lining - an undulated poly-fleece lining that channels the water away from your vitals because the material is 'hydrophobic'. If you look that the pictures you will see a black and red pattern, the red elements protrude higher than the black, this creates a valley/river for the water to move along. GBS & Taped seams - hooked needles result in zero pinholes, therefore no water can move through your seam. O'Neill have amplified durability by gluing nylon strips on the inside of the seams, this means strain is applied to the tape, not the stitch itself. Learn more here. Critical Seam Reinforcement - certain parts of your wetsuit are subject to certain levels of stress, for eg- your under arms strain the rubber a lot more than the middle of your thigh, because of the nature of human movement. See the rounded-square patches in the images? That's what we're talking about. Double-Seal Collar - a two piece collar designed to be smooth and sticky against your neck but because the sticky internal layer is separate to the external neoprene is does not rub against your skin. Check the pictures! ﻿Smooth Skin Chest Panel ﻿- greatly reduces wind chill. Reinforced knee pads - greatly reduces knee wear + tear.